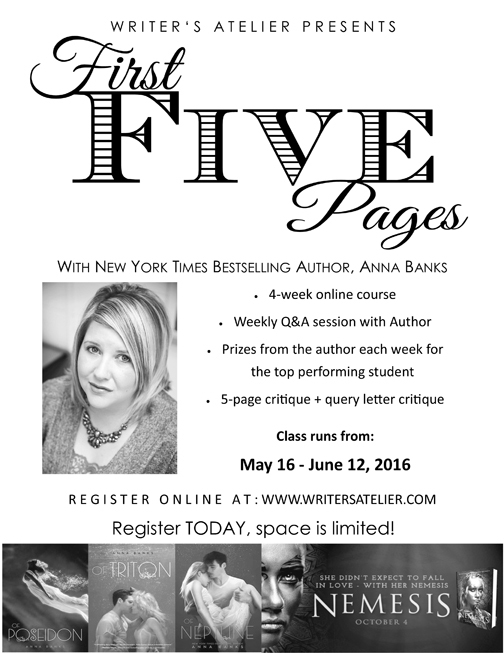 Florida Book News: Writer's Atelier Presents the First Five Pages with NYT Bestselling Author, Anna Banks! Writer's Atelier Presents the First Five Pages with NYT Bestselling Author, Anna Banks! Taught by New York Times bestselling author Anna Banks, this class offers an in-depth look at what your first five pages—and your query letter—should be, and what it should not. You’ll receive homework assignments based on the curriculum and graded by Anna. After you’ve completed the course and are able to put your new knowledge to use, you’ll receive a critique of your now-polished first five pages and query letter by Anna. Additionally, you’ll have access to weekly opportunities to ask her questions as the course progresses, and incentives and prizes to accomplish your very best work. Anna lives in Crestview, Florida with her husband and daughter. Her writer’s cat is a wiener dog named Puckle Doo. She drinks coffee until it’s acceptable to drink wine, and she never met a pair of high heels she could actually walk in.